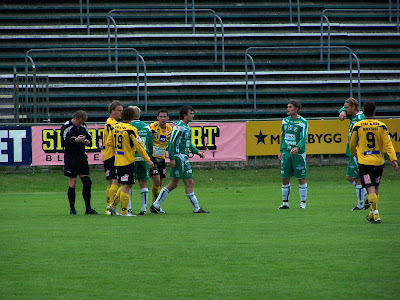 This Tuesday at 18h00 Mjällby under 21 won 2-1 against Öster. 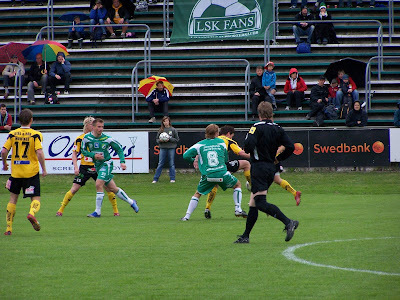 The young yellow were losing 0-1 until the 85th minute while suddenly, Patrick Osiako and David Löfquist woke up: 1-1 with a goal of Osiako with a assist from Löfquist and 2 minutes after goal of the same Löfquist for 2-1. Before that the senior team had trained. Sasa Zimonjic and David Rehn were with the A troup and did the full training. Dusan Melicharek was around playing with a big ball. Erton Fejzullahu was playing with the kids. He had his big toe injured. Adam Berner did a light training alone with the ball. Phille Jonasson was with Dusan. 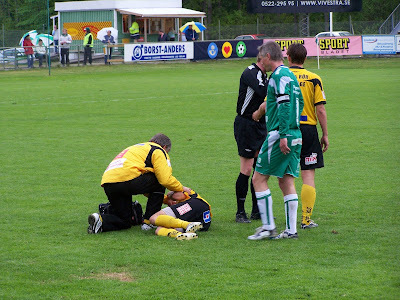 Tobias Johansson injured a shoulder last Sunday and were doing small exercice. 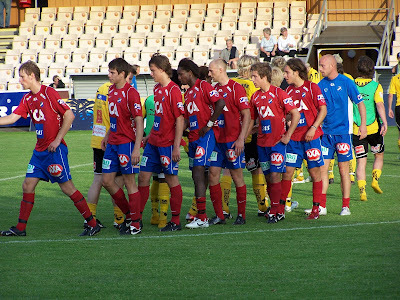 The two players missing were Simon Sjöfors and William Leandersson. 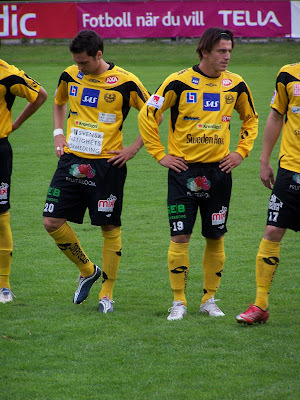 Kim Thörnberg, Patrick Osiako, David Löfquist were with the under 21. There is soon more players looking the other doing the full training. 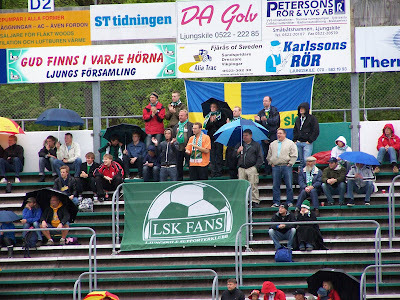 The next game is next Wednesday in the swedish cup against the champion and actual leader Elfsborg. Despite cold weather and rain coming in, the mood was on the top before the game. From the ballet Swan Lake? Rille Fransson - best in field. 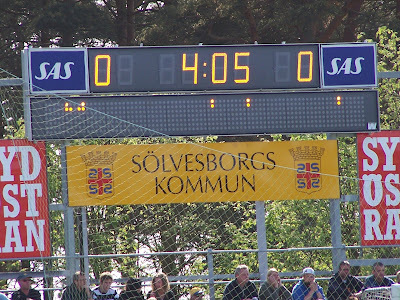 Sarvas leaves for Löfqvist in the 91st minute. 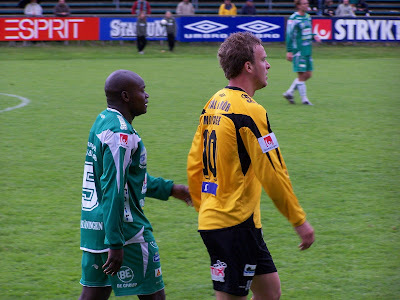 Ekenberg with shadow Phiri (Phiri). The weather was not so good, 10°C and rainy. The stadium a little lost in the forest, only 731 spectators, but a sympathic atmosphere. 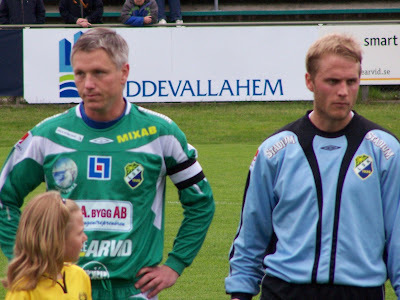 MAIF players were visited by their old friend and captain Hiir-Sa, now a local since he lives in Göteborg. LSK started the first 5minutes very fast, but MAIF controls and reacts well, the best opportunity coming at the 30th minute, after a corner kick, the ball is prolonged but right on the LSK pole and out again. The 2nd half was much more difficult. Best on the pitch was very clearly Fransson, he was good on corners, in the air, he made some very good saves on free-kicks, and managed to keep the ball out in a couple of confusing moments. Central defense Cederberg and Lindberg, did a good job at controlling LSK attackers Wålemark (very routined, trying to provoke fouls and penalties) and Gravem (transfer from GAIS). Ivanovski had a little difficulty to start, but came into the game quickly. Tobbe ok on his left defender position. Alex ok. Danne and Persson had difficulties to control the midfield. Marcello and Erton did some nice actions at moments, but lost a bit many balls. Eken at the top did not have many balls, but worked hard as usual. The pajas was ok, despite a little favor to the home team (he was a local as well). All in all, even if MAIF could have scored in the 1st half and showed a couple of nice actions, we should be glad to take this point because the 2nd half was really difficult. The pictures from the game will be put on the site tomorrow. 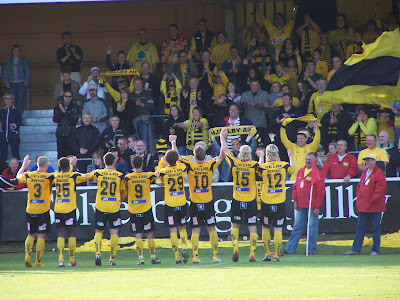 With 9 points Mjällby has started in much better way the season than the two previous year. 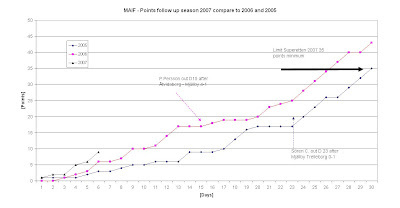 It´s the same total of points that Day 16 in 2005. Next game Sunday 27th of May at 17h00 in Ljungskile. Ze French Mink will be able to do a summary and to post pictures. 2300 people for the third game at home. All the players are there to congratule Adam Berner for the first goal. 2007, year of Philip Jonasson ? Marcus Ekenberg back on his top form and Adam Berner, best player on the field. 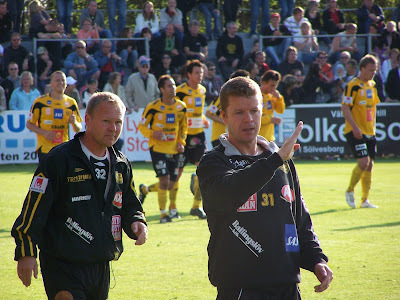 Thomas Andersson and his assistant coach Anders Torstensson. Mjällby is going up ! 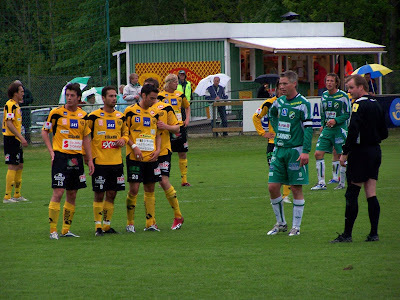 The team with Sillastrybarna at the end of the game. Mark Selmer, correct all the game despite the large defeat in the press conference with Thomas. Reproduction of the pictures of the Ze French Mink is not allowed without the permission of the authors. 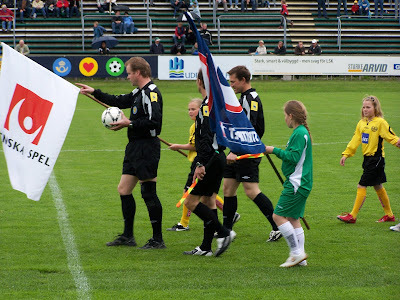 MAIF won a large victory at home today with 5-0 against Degerfors. It could have been even more, Eken's shot on the pole being the most obvious, but let's not complain. The first goal (Berner) came already at the 4th minute. Then Eken at the 16th, a long throw from Tobbe to Marcello who sends it immediately again to Eken all alone at the second pole. 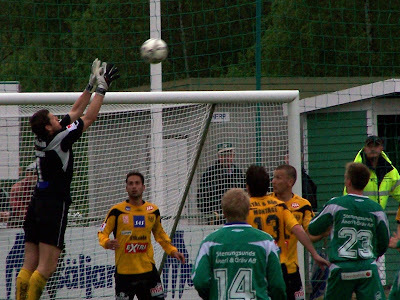 Then Berner again, a wonderful chip above the keeper. 3-0 at the half-time, not too bad. The mood is up among the numerous spectators. 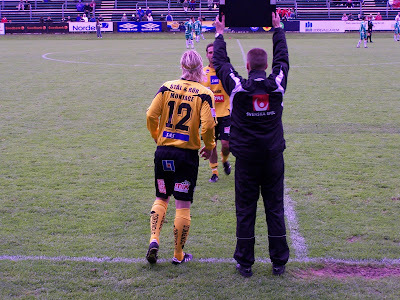 In the second half, Degerfors starts more agressively, but the defense is standing. 4th goal by Marcello, and final goal well deserved by Tobbe, a corner slightly deviated from the head. The game ended a bit oddly, after the 5th game (at the 66th minute), nothing was happening anymore. 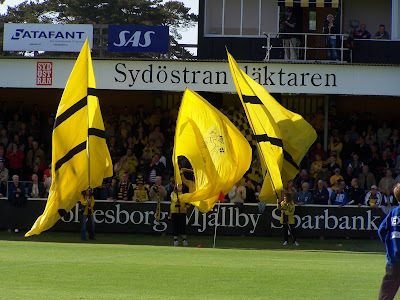 Mjällby was playing ball a little, Degerfors was trying a little but were not really dangerous, ze Strubbarna were not singing anymore, it was deadly quiet. It was only Eken, Marcello, Patrik and Alex still pushing and running around at the top. 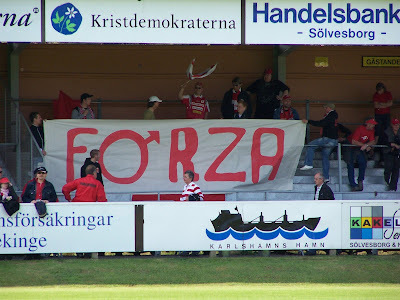 What was striking throughout the game was how inactive the Degerfors guys were. And they have no sides to speak of. They put themselves in dangerous situations by playing in emergency. That's the lesson to learn from this game (in case anyone ever thought it was a winning strategy). 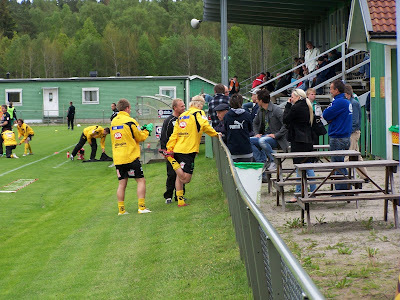 From Mjällby's side, the passing game is still working quite well. The guys are supporting each other. 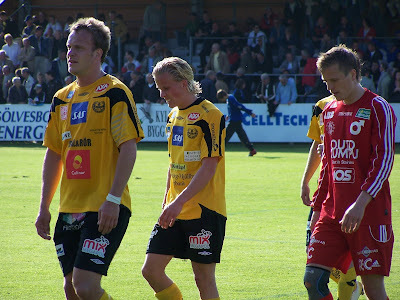 The best players on the pitch today were Eken, Tobbe and Marcello. Eken has definitely come in shape. Ivanovski made good things. Berner ran a lot and also made a mess in the defence, but he was forced to go out after getting injured. Erton needs to get back in shape, he only really played 45 minutes. Mr Pajas was not too bad, but not excellent. A couple of feet taking down players went unnoticed, however obvious they were. This score is quite good for the goal difference. We went from having one of the worst attacks, together with the best defense though, and a goal difference of 0, to having +5, the second best in the league behind the leaders Norrköping. We are now in the 5th position, but not all games of the 6th round have been played, and this goal difference may soon become important if we continue climbing the ladder. 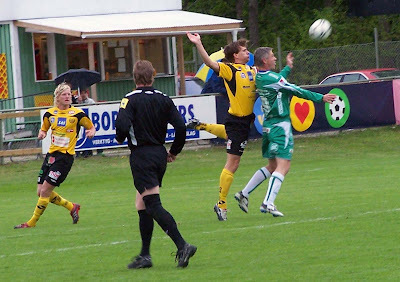 Next game at home is against Åtvidaberg the 3rd of june, and then just after the 3rd round of the Swedish Cup game the 6th of june, where we will welcome the Swedish Champions Elfsborg in person. Technicals problems do not allow me to post picture (Mjällby-Örgryte). We are trying to understand why. 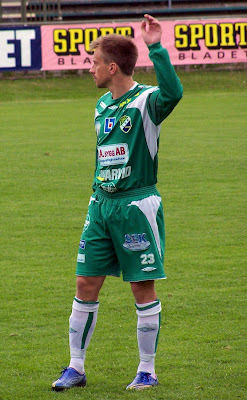 This afternoon MAIF plays against Degerfors 17h00. 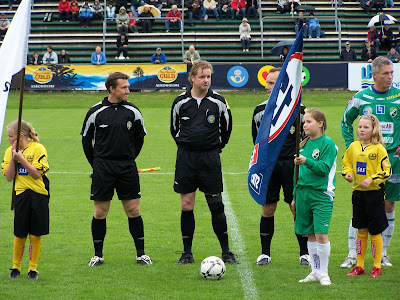 The game has just finished, Jönköping 0 - MAIF 0. 1 more point is good, but still a too few goals to my taste. A little post to congratulate ValjeMinken for his new-born daughter (born on may 2nd). I'm open to proposals for a nickname (MiniMink 2 is not so fun). ... and a beautiful one I may add. A lot of things were just perfect today: the weather was sunny and warm like in july, the grass is in top condition, little or no wind, 1700 spectators. And then the game itself. In short: I will not say that Fransson has been very good, because he's had so little to do that I really cannot judge. All the other players have played an excellent and very entertaining game. The cooperation between Ivanovski and Phille on the right side is working perfectly, exchanging position whenever the other is moving up attacking or needs support in defense. Lindberg, Cederberg were quite stable in defense, only one mistake each, luckily not simultaneously so it didn't lead anywhere. 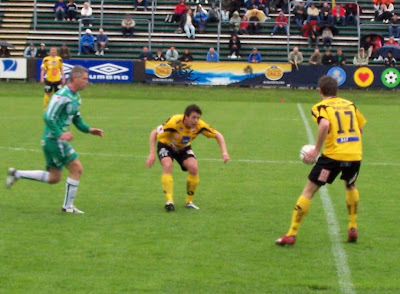 Tobbe as well, in an unusual left defender position, to replace Wille. 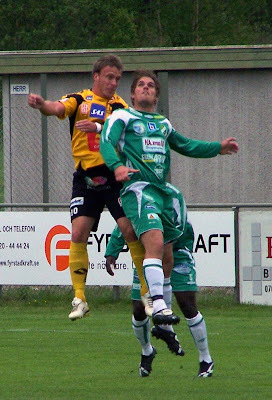 Tobbe scored the second goal, and hit a very good and strong volley shot just on the bar. In the midfield Danne and Persson were giving the ÖIS guys a hell. Then the ball went to Marcello who has today been absolutely outstanding. He was involved in all the attacks, he served Eken for the first goal, shot very good corners kicks. At the top Eken and Berner worked quite well with each other. Berner missed a couple of opportunities, but he still acomplished a lot of work. Finally, even Mr Pajas himself has actually been quite ok today. Although the game was very nice overall, with very few fouls or nasty actions, so he hasn't really had the occasion to express his talent. The line-men were active as well, an appreciated sight. I think the new guys have finally integrated in the team. By that I mean that they are finding each other and cooperating and supporting each other very well. As previously mentioned, the passing game is very good, much better than last year. Also, the players have now come up to speed physically. For example Eken was this week not the same as two weeks ago, clearly faster, stronger, more technical. Even with a lot of key players injured, the quality of play was at the very top. But it's clear that the bench is a little weak, with mostly youngsters. Honestly you couldn't tell ÖIS was the team coming down from Allsvenskan, as their level of play (very static and mostly backwards) was at least a notch or two below MAIF's. Or maybe they have lost absolutely all their players from the move down. With a playing quality like today's, we can no doubt come home from Jönköping next week with another 3 points and continue to move up the ladder. 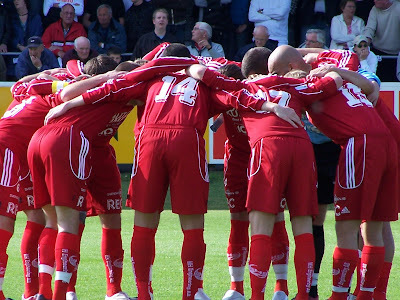 I even start to dream about the Cup match against Elfsborg: playing like today, we will definitely not be ridiculous, and it's absolutely not obvious that last year's Swedish Champion (who've made an average start so far) will continue in the Swedish Cup. We'll see.